Almost looks store bought, right? I am slightly obsessed with Lilly Pulitzer. If my budget and lifestyle allowed, I would wear it all day everyday. My planner is Lilly. My phone case is Lilly. I even have Lilly pj's, a Lilly umbrella and make up bags. Don't believe me? Check out my Lilly Pulitzer Pinterest Board. The only problem with my obsession is the price tag. I pretty much only buy Lilly Pulitzer on sale (big sale!) or get it as a gift. I am pretty successful and finding it at TJMaxx, Lohemann's, on daily deals sites (RueLaLa), or just waiting for a major clearance sale. In my dream world, I have this Lilly Pulitzer Christmas tree and these Lilly pumpkins. Except I can't find any where to buy them at all let alone on sale. So I decided to create my very own Lilly Pulitzer holiday decor. Keep in mind that this is really my first DIY project since I use to "scrapbook" in high school. Also keep in mind that I had to borrow my mom's glue gun because I don't even own one myself. And if you get too close, they don't look too pretty. Despite all that, I am beside myself with excitement about how this wreath turned out. This wreath is a combination of some very common projects cycling around the internet and the world of DIY. 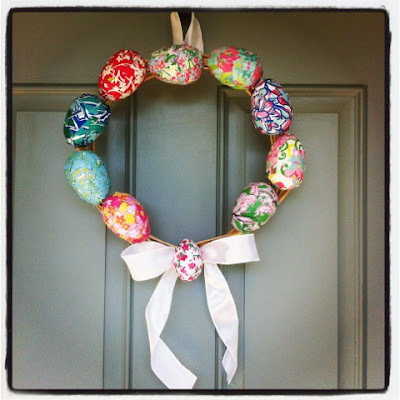 It's kind of a marriage of decoupaged eggs and the hot gluing of plastic eggs to a dollar store wreath. Here is the very simple process. 1.) Ideally I would have used Lilly fabric for these decoupage eggs but since I didn't have any on hand I used old pages from last year's planner and pages of the recent spring catalog which you can request for free online. I just picked out the patterns I wanted to use and ripped them up into the right sized pieces. The tile here is for the decoupage coasters I am hoping to get around to making some time soon. 2.) I then decoupaged the scraps on to plastic Easter eggs I got for .99 cents a package at Target. 4.) I added a loop of ribbon at the top of the wreath once I realized that because of the eggs it wouldn't fit on my wreath holder for the front door. Sadly that four step process took me a few days to complete. Oh well, I am in love with the final product and couldn't be more excited about how cute it turned out. This is super cute! It even looks like something I could do. Thanks so much for posting your links on my Linky Party Page. it certainly turned out very well! i love the bright colors! This is lovely, and a great idea. This came out great - it does look store bought! So cute! You did a really great job with this. You should pat yourself on the back :-) Thanks for sharing. Pretty impressive! Certainly brightens up your front door! Looks great, thanks for sharing your cute wreath. I think it turned out great!! I love how colorful and happy it is. Great idea to use the cheapo plastic eggs to cover!! Thanks for sharing with us at Link It Up Thursday. Love all of these bright, fun colors in this wreath!! Great job! Thanks for sharing at oopsey daisy! That is so pretty!! You did an amazing job! Cute!! Thanks so much for sharing at Thursday's Temptation. Super cute! I love all the colors! I've never actually heard of Lilly Pulitzer before - I will have to check out your Pinterest board. Thanks so much for linking up to The Creative Spark. Happy Easter! I love Lilly too! This is just soooooo pretty! Thanks for linking up to Manic Monday. This is a sweet idea! I love all the different papers you used. Beautiful wreath!!! Thanks for Sharing!